Cauliflower is a great nonstarchy vegetable to cook as the holidays come up. Try this savory recipe out that will pair great with some Roasted Turkey and Vegetables. Heat 1 Tbsp. of the olive oil in a large heavy skillet over medium heat. Add the pancetta and cook until it is crisp. Remove the pancetta with a slotted spoon. Set aside. Add in the onions, and turn the heat to medium low. Sauté the onions for about 8 minutes. Add in the cauliflower, salt, pepper, and bay leaf. Add in the water, cover and raise the heat to medium. 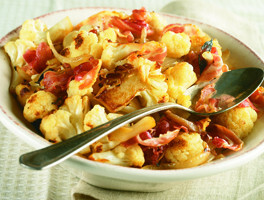 Cook for about 10 to 15 minutes, stirring occasionally until the cauliflower is tender and lightly browned. Remove and discard the bay leaf. Add the cauliflower to a serving bowl. Mix together the remaining olive oil and lemon juice, and add to the cauliflower, mixing well. Top with the crisp pancetta.